After buying an iPhone by spending ten times more than normal Android phones, how unfair it is if it cannot play MKV, AAC and FLV format videos? Also imagine inability of playing iPhone HEVC videos with old version of quick time, Photos, Final Cut Pro, iMovie on your favorite MacBook and even on Windows Media Player, adobe on Windows PC. Let me take this much further by letting your know that 4K 60FPS videos shot with iPhone won’t play smoothly on VLC and other major media players. To be more obvious, iPhones cannot play drone and GoPro video formats as well. Why is this happening with your iPhone? The answer is simple. You might be having an old iPhone (older than iPhone 7) or a new one. The interoperability between the old and new iPhone is limited by the hardware under the hood. To be particular, new Apple codec HEVC (H.265) is compatible with iPhone and later versions. Therefore, videos shot on iPhones older than iPhone 7 cannot play them. It’s that simple. Do you need to upgrade your iPhone? I would say that if I was Apple’s CEO. I’m one of those who still love the design of iPhone SE over other future models. I know you are one of my kind. So, let me introduce you the best solution for iPhone video format incompatibilities and issues related. I introduce to you, VideoProc – the best video converter I’ve come across in these recent times. What is VideoProc Software? Why I think it is the best so far? 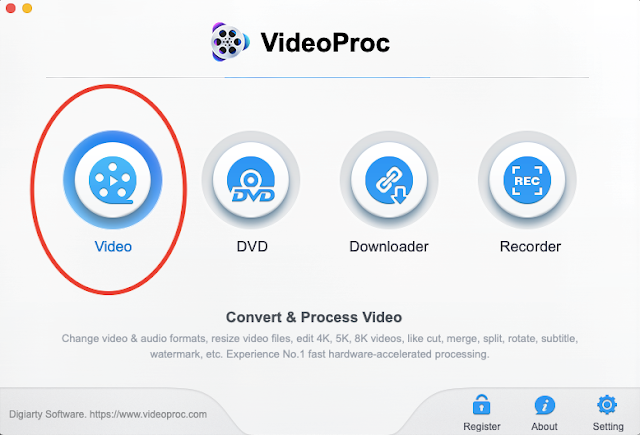 VideoProc is a one-stop solution for video processing that I’ve come across while searching for my iPhone video format problems. It saved my iPhone from being smashed to the floor. Why it is the best I’ve seen so far? VideoProc is the only software that processes video by utilizing full GPU acceleration. It processes the video 3X faster than other tools in the market by utilizing hardware acceleration powered bu Intel, AMD and NVIDIA GPUs delivering smooth 4K video editing experience and without compromising on output quality. The full hardware acceleration will help not only to transcode and process the video but also to optimize the file size and video output quality. 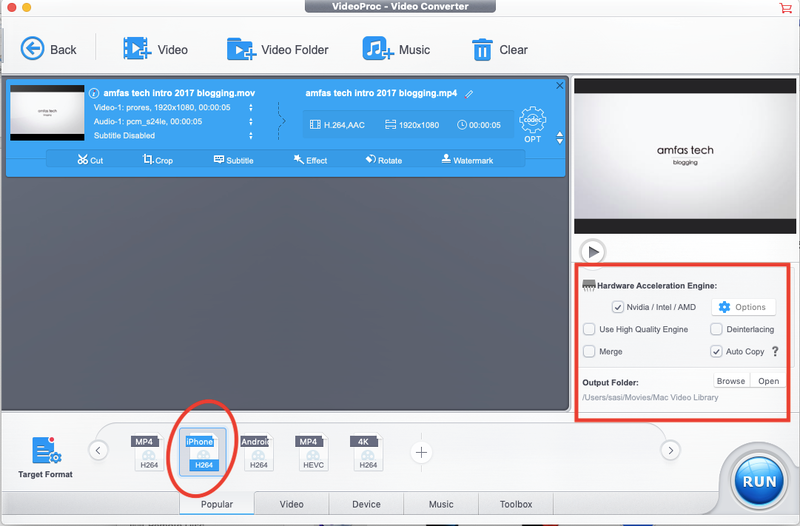 After installing the VideoProc video converter on your Mac or PC, run the software. It opens up to this following screen. Step 1: Select the first option, ‘Video’. It will open up the video converter wizard. Step 2: Select ‘iPhone’ from the available formats to be converted into and add the video into the work space. Step 3: To configure the hardware acceleration, click on ‘Hardware Acceleration Engine’ and it opens up the following screen. Check or uncheck the options to get the desired output quality powered by hardware acceleration. Step 4: When done, close the hardware acceleration settings and click ‘Run’ to run the video conversion process. Video Converter – VideoProc converts videos of all formats into compatible formats to iPhone and Android. You can set the output format to MP4 H264, iPhone, Android, MP4 HEVC and 4K H264. These options are the popular video formats and so why they are made available on first sight. It can convert videos into 4K, MP4(H264, HEVC, MPEG4), AVI, WEBM, MKV, MOV M4V, MPEG-2, DIVX and 3GP formats. VideoProc can also convert videos in device compatibility mode. It can convert videos compatible to iPhone, iPad, Huawei, Samsung, Oppo, Vivo, PS4, Xbox and Mi devices. Convert & Backup DVD – VideoProc’s DVD tool rips DVD with files of 180+ formats and backs them up in a hard drive safely. This ripping process won’t take more than 5 minutes as hardware acceleration involved. Downloader – VideoProc can download most highest quality available from the 1000+ streaming sites including YouTube and Facebook. 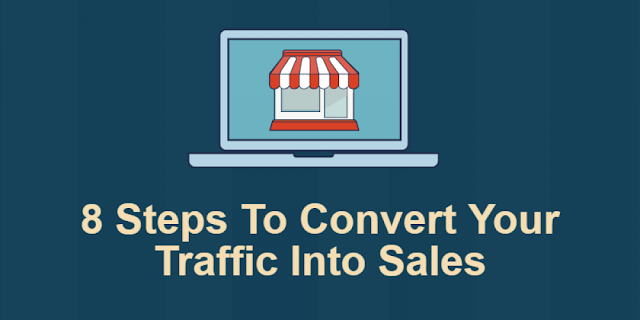 They can be directly converted, saved on and sent to your mobile phones later. Recorder – This is a screen and web cam recorder feature comes with converter stitched along. The screens recorded videos can be then converted on the go and can be uploaded to YouTube as well. It supports screen record and webcam record at the same time. All video file formats, GPUs and operating systems supported can be seen on this technical specification page of VideoProc. Processor – Intel and AMD processor with minimum 1GHz. Choosing an iPhone is not your mistake. Don’t even blame Apple for the incompatibilities over media playing. You won’t get a better phone with security like iPhone unless you are the president of the United States of America. VideoProc snaps away your guilt and makes you feel proud again for having the luxurious phone in your hand. Get your free trial of VideoProc software now and thank me later. 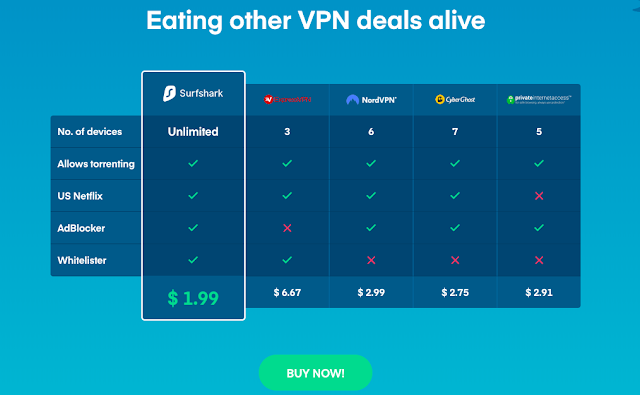 Before directly jumping into the Surfshark review, let’s talk about VPN first. If you already have some knowledge about VPNs, you may skip the ‘about VPN’ section of this article. The internet is censored in all perspectives. It is good thing for half of the world but restricts access to the important links in the information. The other half of the world still need this freedom of accessing knowledge. Restrictions aren’t bad – The freedom of access to information on internet is as wild as nature with danger and opportunity at equal level. This poses risk to the society if the information is exposed directly to the users in front of the computer – as the computer will not know the age of the user. VPN is Virtual Private Network where an user connect to the private network to operate out of the restriction based public network. Why you need a VPN? Access to unrestricted web – You can access unrestricted web using a VPN software, it gives access to all content with any censorship. Privacy set froth – Through VPN, search engines and advertisers cannot track the user to push targeted ads. No cookies can be used to track the user’s behaviour on internet. It projects clean browsing experience to the user ensuring safety and privacy of personal information. Surfshark Is a VPN software – one of such kind of software that was talked about in above introduction part. Located in the British Virgin Islands where there are no obligation law to the data retention, Surfshark finds a perfect place to run their servers. Located in the 50 different parts of the world with their servers connecting and switching through the optimal locations that are nearer to the user’s location. The DNSs will be automatically changed along with IPs to create a secured mask. However, Surfshark does not collect the data from incoming and outgoing IP addresses, browsing, downloading or purchasing history, VPN servers you use, used bandwidth, session information, connection timestamps and network traffic, thus giving privacy the first priority. Unrestricted Internet – The core feature of the VPN software that opens gates to the unrestricted web for original information access. Faster internet – There will be no difference between the speeds of normal connection and VPN connection. Unlike other VPN software programs, Surfshark VPN implements intelligent IP and DNS switching technologies that ensure faster internet to the user. Clean web – As the trackers cannot trace the users behaviour, no personalised ads will be showed while browsing. No malware will be pushed onto the web browsers promising safety to the user. Kill switch – This feature will safeguard the connection in case if it is compromised. Multihop – This feature establishes double VPN chain giving twice the layer of security. Encryption – The top class encryption algorithms are introduced to guard your personal data. Strict no logs policy – Surfshark’s VPNs are located in the British Virgin Islands. Therefore they is no need to maintain logs of your activity as their law of land won’t insist them to do it. This even won’t help if you want logs of your own activity. Unlimited devices – One account signup is enough for multiple devices. You may use one account to login from any number of devices either from your home or office. Privacy over public WIFI – Public WIFI connections are not secure. But, Surfshark ensures safety with them too. IP masking – IP address of your device cannot be traced through IP detection techniques. So your security over IP connections are secured. Zero-knowledge DNS – The private DNS servers will not entertain any security breaches. Easy operation – Surfshark VPN offers a clean one touch turn on/off operation for the users. 24x7 support – The support is available for any assistance 24 hours a day and 7 days a week. Any issues can be addressed to them for perfect solutions. How to buy Surfshark VPN? It is as easy as buying anything on internet. The subscription plans start as monthly, yearly and for 24 months. 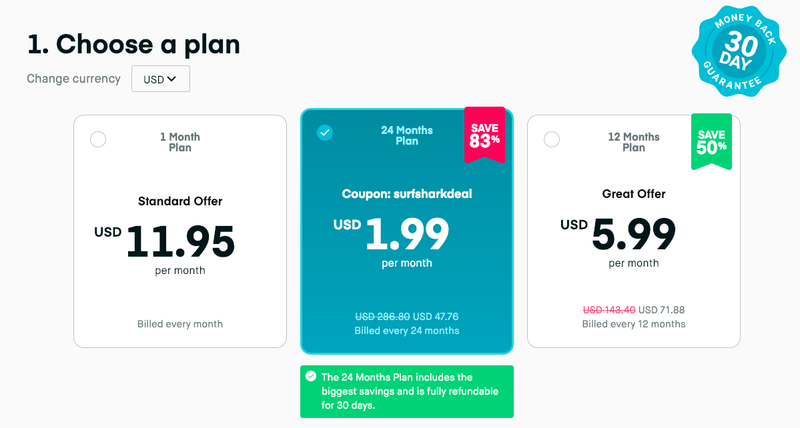 There is a 30-day money back promise from Surfshark if you don’t like their service. The payment can be made by any means of card, PayPal and cryptocurrency. Wait a second before you click that signup button. Use the following link to get it for $1.99 per month. You couldn't get better than this deal. VPN software isn’t new. All that matters is the encryption that user gets while using it and speed of internet at the end of the day. Surfshark promises both the features. 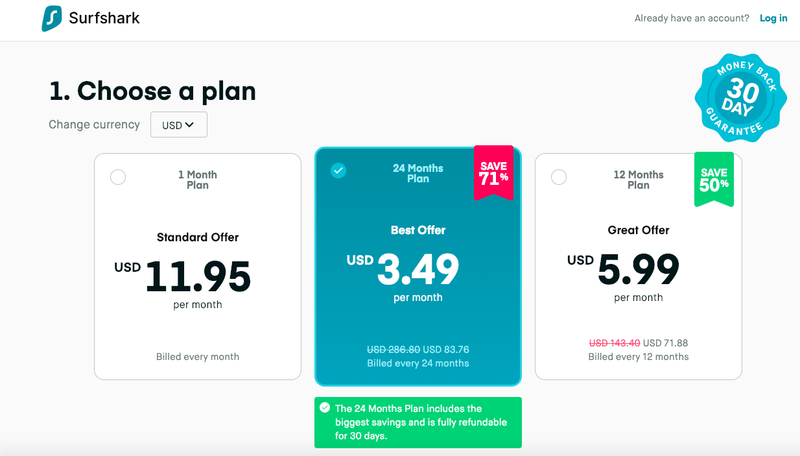 As there is a 30-day money back guarantee on all plans, an user gets ample of time to test the tool for the purpose. What do you think? Did you ever use Surfshark VPN? What are your thoughts about it. Do share in comments below. Initially considered as an Apple developer hack, extensions became a useful and standard way to provide a modular operating system to users. These extensions are small pieces of code which are used to extend the system’s functionality. Many important system services including USB and FireWire support are optional components implemented as extensions. In Mac systems, Safari browser offers users a wide range of extensions to customize their Internet experience. It also allows optional third party browser extensions to be installed on your system to perform various tasks like social sharing, note taking, interface with different apps like 1password etc. These extensions are considered to be useful and nifty tools but sometimes they also create problems to browse normally. Certain outdated and obsolete extensions need to be excluded from the list to enhance the browsing experience. Let’s discuss a method to remove Safari Extension on a Mac from your Safari browser. Removing Safari Extensions on a Mac? Open the Safari app in your system and go to “Safari” menu and select “Preferences”. Click on “Extensions” tab, it will open the list of all extensions installed on Safari. Select the extension you no longer want in Safari and click on “Uninstall”. Confirm the removal in the pop-up window to remove that extension. Follow the same method to remove other unwanted extensions on Safari. First Quit Safari on your Mac. Instantly you will be in the Safari Extensions folder on your Mac, remove any extension you want from Safari on your Mac. Remove Safari Plug-ins: Safari Plug-ins are different from Safari Extensions. Safari Plug-ins include better functionality and tend to be feature-rich media viewers like QuickTime, Adobe Acrobat reader in Safari etc. You can enter following paths to locate Safari Plug-ins. Most of the times you don’t require Safari extensions or third-party Plug-ins as simpler Safari installation can deal with any difficulty with the browser on the Mac. If you have updated system software and removed cache and still facing problems like Safari crashes, then you should consider checking Safari extensions. It happens more often when some extensions or plug-ins have not been updated yet to be compatible with the latest version. Summary: Safari extensions are a useful addition to the browser to perform numerous tasks. Though certain obsolete and unnecessary extensions become a problem for the browser. In this article, we can discuss the ways to remove Safari Extensions on your Mac. Yogesh Sharma is working as an SEO personnel and technical content writer for Systweak. He likes to talk about various threats to cybersecurity and cybercrime awareness in his blogs. MS Outlook, being one of the commonly used desktop email client is very familiar among several users for emailing purpose & the inbuilt Office applications provided with it. The most common error that has been encountered by most of Outlook users is error 0x8004060c. This error has been found in multiple versions of MS Outlook, without any warning or may affect the send/receive emails option on an Outlook Account. The blog will be discussing about the same error and the method to resolve it. This error is one of the common error messages that users of Outlook has faced, which occurs when user attempts to send or receive an email, remove contact, update the calendar etc. The error may make Outlook crash at irregular intervals, unable to view attachments, prevention of incoming new mails, and other issues. Since oversized PST file is the main factor for the error discussed above, we need to be able to reduce the size of the PST file. The earlier versions of Outlook supported only 2GB size limit of PST file, which was increased up to 20 GB in Outlook 2007. Now the maximum storage supported is 50 GB with the introduction of Outlook 2010. When the PST reaches its limit, the performance will automatically slow down, and oversized PST file becomes more prone to be corrupted making it inaccessible and leads to partial or complete data loss. Reduce the overall size of PST file by deleting some of the unimportant or repeated emails & other data items from inbox, deleted items, and other folders from the Outlook account. These items can be deleted using SHIFT + DELETE to free up the space in Outlook PST file. Second method is to use the Compact option available in Outlook to reduce the size of PST file. When the items are deleted from PST file, the file is compacted in the background while not using computer or Outlook is running. To reduce the size immediately, compact process is used. This method is used when the size of the PST file of an Outlook account is very large. In order to reduce some space, user can move some of the items and archive them in a new PST file. Archiving feature helps in reducing the current PST file size by creating new PST and storing items in it. The truncation facility designed by Microsoft is a tool that helps users to create a truncated copy of a PST file allowing recovery when size reaches over 2GB. The copy of the PST file does not contain complete data as the tool cuts the amount of data from the file as defined by the user. This utility helps in dealing with corruption issues or damage in Outlook data files i.e. OST and PST. Scanost.exe was used earlier to repair the OST file, which was later replaced by scanpst.exe for repair of both OST and PST files. It will scan and repair the corrupt file. However, it does not guarantee complete recovery of data items. 1. Go to Start and type ‘regedit’ and click OK.
4. Double-click on MaxLargeFileSize value and select Decimal and enter new size limit in the value data box and click on OK.
6. Close the Registry Editor. In the blog, we have discussed about one of the most common error encountered by Outlook users related to Send/Receive error that restricts users to receive any new incoming mails. It has been found that the main factor for the error is oversized PST file size. Along with the causes of the error, the blog further describes several methods on how to solve 'Unknown Error 0x8004060c' in Outlook. Clark Kent is one of the Microsoft Outlook Expert and an author of MS Outlook Ware. He has experience more than 21 years in IT industry and at present he is working in a Data Recovery organization. He has quality expertise in the Office Products especially in Microsoft Outlook and love to resolve users query by providing best solution. Web designers have faced with the new tools on the web in 2016. After they’ve tried them, they realized that some of them are very useful and simple for everyday usage, but for some of them they need to spend more time in learning and involving in their design. What’s new in web designing? Whatever you want to design and even you are a beginner or your design project is at the start yet, you can try some of the tools like Webflow, Origami, Relay, Frontify, Marvel or Avocode. You can also use some of them during the trial period, some of them are free and if you plan to make a big project, you should consider the monthly paying for some of them - that will be worthy of the long term. Don’t worry if you are one of those designers who like a classic in their designing. You can try some of the classic tools available on the web. Some of them are Square Space, Builder Engine and Dunked (the best tool if you haven’t learned to code by now). But, what if you are one of those who are practically lazy to learn something new, try new options and check what’s new every minute? Are you a bad designer? Or not? Are lazy web designers really so bad? There is a statement that lazy people are actually good for any kind of job because they’ve learned to do more job in less time. They will not waste their time on long and boring coding; they will always try to find an interesting content easy to use. They also know how making a perfect project, which forces people to accept and understand the content very fast and without too much time spent on reading. Every fast and useful tool actually came from lazy designers and programmers. Their sites are clean, readable and without too many information. But, on the other hand, the lazy designer has to be dumb, too. He must know that learning is everything and that nothing is possible if you don’t admit first that you have to learn so much. Smart people think that they have learned everything. Dumb people learn every day. So, if you are one of those lazy designers, or just don’t have time for making the big and complicated site, don’t worry, you are not the worst person at all. The only thing you should do is to use smart your laziness. Maybe this list of the tools is as made for you. You should try TabsGenerator.com. This completely customizable tool will make much easier creating tabs acceptable in practically any design. Even the basic design, color, and shape are already made, the designer can adjust every part to his site and short the time needed for this step. Do you need more colors? There is a solution for that, too. Its Color Scheme Designer, a simple tool with already made pallets of colors and combination of colors which you can use. You also shouldn’t worry about the looks of dark and light version, because there is a sample of that included. Do you want to eliminate dummy text before sending content on the site? Tool creators have made an effort to make a simple and very useful tool, Bling Text Generator.com, for resolving a problem with dummy text. The only thing you need to do is to plug the type and how much dummy text you want and give to a tool a chance to resolve it. You also should consider a tool called Typechart.com because it will provide you thousands of samples of different sizes, fonts and text options so you can easily choose whatever option you need for the site. Finally, what about the layouts? There it is a simple tool, YAML Builder, for this problem. If you know what layout want to put, this tool has an easy-ten-use visual interface and you simply can choose one of those which is most approachable or similar to your idea. Now, just put content and code and, "voila", the job is finished. See, it’s no problem if you are lazy; the problem is if you can’t do the job even you are a lazy person. Thanks to tools, that problem is resolved. Tom Jager is professional blogger. He works at Royal Essays. He has degree in Law and English literature. Tom has written numerous articles/online journals. You can reach him at G+ or Facebook. Trotux is one of the malware programs that hijacks the browser settings and occupies the homepage and search. This malware program comes with some free software. This would actually be installed with the free software that you download with or without being noticed. Trotux infects the 3 major browsers, Google Chrome, Mozilla Firefox and Internet Explorer. It hijacks the browser shortcuts on the desktop and hijacks the browser settings by not allowing you to change/remove anything. The confusing thing is that you won’t find any extensions installed in the browser settings. You may not even find the malware in the program files or even existed not with the same name. In such cases, it is better to contact the expert user. Because, a technician might bring up service bill to stars in the sky. No! I’m not serious. You may reach out to a technician if you are really serious about it. But, before that, try this out. The actual Trotux that I’ve encountered is on my cousin’s computer. When I asked about it, he said that he was trying to download the IDM (Internet Download Manager). He ended up download the fake IDM setup with the uninvited guest of Trotux malware. Step 1: If this happened to your own computer, find the program or file that you have recently downloaded and remove it first. Yes, the setup file I mean. If this happened to your friend’s or family system, ask them what did they do and when was the last time they used it in good health. Find any malware program or files and remove them manually. Step 2: Scan your computer for malware with the anti-virus software. At most cases, anti-virus software might not detect such stealth malwares on the system. Even the official Chrome malware cleaner tool cannot identify Trotux hijack. This is not to scare you but the fact. Step 3: Download Malwarebytes on to your computer and install it. Make sure it doesn't flag any incompatibilities with the existed software on your computer. If Malwarebytes shows any incompatible software, remove it first temporarily and run Malwarebytes stress free. What happens if Malwarebytes is run along with the incompatible software? In short, Malwarebytes might not be able to perform the malware scan as efficiently as it supposed to. Or the computer might slowdown or crash by running two incompatible software. Deadlocks happen it most cases. So avoid such situation as far as possible. Step 4: Scan the whole system with Malwarebytes and let it list out the threats. When finished, remove the shown threats. Step 5: Restart the computer. Open the bowser and check now for the Trotux. Good if it is not visible. If it still shows up, better consult a technician for the sake of your data security. Share this solution to your friends and help them get rid of Trotux browser hijacker. Comment below if you need any further verbal assistance regarding this. I’ll be happy to help at my knowledge level. Have you recognized this error mentioned in the screenshot? Yes, it appears most often when the system logic does not identify the corresponding file. It clearly indicates that the file is damaged. To deal boldly with such incident, it is necessary that user must have knowledge about the type(s) of corruption the file has entered into. Knowledge of inbuilt repair methods is another way to deal with the issue. Moreover, the perfect sense to deal with ‘Access Denied’ issue is assistance from third-party tool. The most peculiar event occurs when the known PDF file becomes inaccessible. This moment has witnessed the erroneous functions like ineffective running of file scripts on startup. To fix them it is advised initially to reset the settings from Preferences. Followed by Security (Enhanced) > Unmark ‘Enable Protected Mode at Startup’. Although user can manage these manual settings, but problem even persists when PDF files are actually corrupt. Such corruption is due to virus attack, improper download from source and other reasons. To deal with all such issues, it is recommended to take assistance from third-party software. The assistance from third-party software guarantees solution to all type of PDF related issues. The third-party software are built with powerful algorithms to drive the entire PDF recovery process swiftly and safely. Such tools are designed keeping in mind the requirements needed in the purpose. PDF corruption is sometimes considered as boon and at the same time considered as bane somewhere else. PDF corruption is boon when the PDF source is corrupt with virus attack and files sent from such source also contain the same potent viral copies. If user downloads it without protection mode, then it is clear that user’s system would get crash. Therefore, it is always recommend to open the files in ‘Protected Mode’. On the contrary the PDF corruption is bane when user who is in need of PDF document fails to access the file. It could be tackled by making certain changes in ‘Preferences’ or registry in the system. In totality it would be better to present that user must take assistance from third-party software that has been designed to provide satisfactory results. The author of this article, Shiv Gupta is an IT expert and has a good knowledge about dealing with various pdf file errors. In this write-up also, he has emphasized on yet another error and the working way to deal with it by using third party PDF repair tool, Kernel for PDF Repair software. Downloading or updating drivers for a computer according to its hardware is a professional task. You may have to take your computer to a technician every time something goes wrong or some device’s drivers corrupt. How great it would be if you could find, download and install drivers all by yourself safely? Driver Dr is a wonderful tool using which a PC user can download or update the appropriate drivers on the PC without the involvement of a technician. This tool creates a restore point before it does any changes to your PC drivers software. Incase anything goes wrong during the process, you can simply restore your PC back to previous health condition. How to download and install Driver Dr tool? Step 1: Go to www.driverdr.com and download the product. Step 2: Right click on DriverDr_Setup.exe file and ‘Run as administrator’. Go through the installation process. Step 3: Click ‘Finish’ to launch the program. The home screen shows your computer configuration. Before you proceed, register the product using the license key (enter the giveaway and get a key for FREE or you may buy one directly from the site). How to download or update drivers? Step 1: Run the software and click ‘Scan Now’ button. It scans the whole system for outdated and missing drivers and lists them out all. Step 2: Click on ‘Get Drivers’ button to see the available drivers information. Click on ‘Download’ button to start downloading the particular driver. Step 3: Click on ‘Install’ button to start installing the downloaded driver. It creates a restore point before installing to handle the problems caused. Step 4: Confirm if the installation is successfully done or not. So you finally got Windows 10 on your computer. Did you perform an upgrade or a clean installation? Hold on! Whatever the way you used to install will not stop the havoc coming due to some ignorant mistakes and incompatibilities. 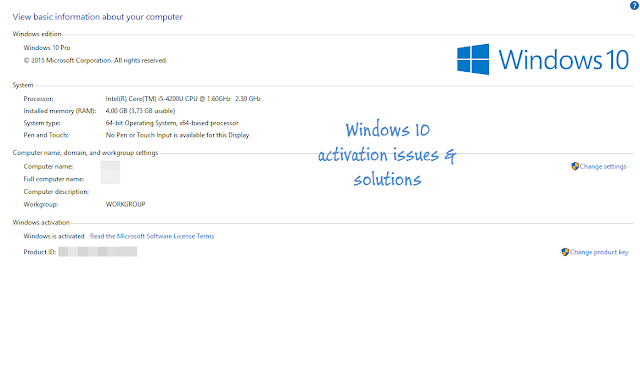 Installing Windows 10 have showed up activation issues on most of the computers. This happens when you have done the following. Windows 10 need to be connected to the internet to activate itself after the upgrade. There might be two reasons if it is not yet been activated i.e., it might have not been connected to the internet or the activation servers are busy. If both are not the cases, the only reason might be the upgrading has done on a computer which had invalid license all the time. If you have upgraded from invalid licensed older Windows to Windows 10, the new operating system would go for a cross check online and if the license is no valid, will not activate the product. Solution 1: Go to Windows support site and check for the reasons that apply. If the error is caused due to invalid product key, get a new one from Microsoft store. Solution 2: Get an original older Windows operating system from any other ecommerce retailers for easy buying. To make it much simpler for you, I’ve listed out Windows versions of Windows 7 and Windows 8 to buy (for better results, pick a version that you had on your computer with invalid license so far). Even if you are upgrading to Windows 10 using the ISO file that was created using the media creation tool, you have to choose ‘Upgrade Windows’ option instead of ‘Custom Installation’ method. Or else, you will be asked to enter the product activation key for Windows 10 because you didn’t let the upgradation happen through the valid channel. Solution: Go back to your previous operating system and check if the older Windows is activated. If it is activated, then proceed with the process again, by selecting ‘Upgrade Windows’ option this time. If you have formatted or replaced your hard drive in which you want to install Windows 10, you won’t be able to use the product key of your older Windows OS without having it installed on the computer. Or else, you will get a 0xC004F061 error. Solution: Install the older operating system from which you wanted to upgrade your PC to Windows 10 first and then try the upgrading process later. If you ever had taken your PC to a repair shop or technician who does all the fixes, there will be chances that he might have replaced your original OS with another patched version or installed another license key. You won’t find the difference until you cross check for its validity in such cases. The key will be blocked during the cross check process if it was used on more than allowed number of PCs. Solution: Replace the original license key of the product with the invalid one and then start the upgrading process. Just like in the above case, if you have shared your OS with your friends or installed it on your current PC after being used on more than allowed number of PCs, the key would be considered as invalid. Solution: Buy a new license in order to activate your current version of Windows and try upgrading it later. If you have an unpublished version of Microsoft Windows license key installed on your PC, you cannot activate your Windows 10 after the upgrade. Solution: Report about the counterfeit software to Microsoft and buy a genuine license key. If you have brought an used computer or bought it second handedly, the license key on it might have been used on multiple PCs by then or it is given to you with disallowed version of OS installed on it. Solution: Ask the seller for the original Windows DVD and license key. If he don’t have it, you have to buy a genuine version of the license key. If you have made substantial changes to the hardware which directly impacts the activation of the operating system software, activation issues might arise. Check out this solution from Microsoft website in such case. Microsoft, after giving up on the internet explorer, the long stayed companion for Windows operating systems have introduced a new browser with a name ‘Edge’ with Windows 10. As they have been saying that their new Spartan project is going to bring a light weight web browser, have brought a really new browser with really needed simple features. Edge has an option in Settings > Advanced settings called caret browsing. It allows you to copy down text on the webpage with your keyboard. It might not sound familiar but, there is something else you need to know about it. caret navigation is a kind of keyboard navigation where a caret (also known as a ‘text cursor’, ‘text insertion cursor’, or ‘text selection cursor’) is used to navigate within a text document. When you are copying down the text from the webpages on Google Chrome, you cannot put your cursor somewhere and just copy text by using Shift+Arrow Keys. Some part of the text, say a word at least must be selected in order to activate the Shift+Arrow Keys combo. Where as in Microsoft’s Edge browser, if ‘Always use caret browsing’ is turned on, you can get the blinking cursor (caret cursor) by just using F7 to toggle the functionality on/off. Using it, you can just click to place you cursor anywhere on the webpage and use Shift+Arrow Keys combo to select the text. Mozilla Firefox has has the same functionality but, it won’t display a blinking cursor on the page. You can still just click in the middle of the text on a webpage and copy the text freely. Watch this video demonstrating the caret browsing functionality. Caret browsing also allow us to copy text in forward of backward direction using the navigation keys (arrows keys). Google chrome lacks this feature yet. You can get this feature by installing this chrome extension which is not so cool compared to Firefox and Edge browsers. This somehow proofs the work of Microsoft on Edge all these days. We should appreciate them for making the default browser of the operating system really usable. Bloggers and webmasters often encounter DNS errors in Google Webmaster Tools. The message saying “Over the last 24 hours, Google bot encountered 40 errors while attempting to retrieve DNS information for your site. The overall error rate for DNS queries for your site is 14.8%.” will worry you till it is resolved. We will discuss the possible solutions to this problem and will try to find a solution(for which you came here) that can solve your problem by the end. Check for error rating – If the error rating is closer or equal to 100%, check if name servers are correctly configured or not. Go to your domain registrar’s dashboard that is provided to you when buying the domain and set the values correctly. If you have no technical knowledge to change them for yourself, ask the registrar without any hesitation. I recently bought a domain from your site. I am facing some DNS errors after changing the URL in the Webmasters tools. While checking for error rating I wanted to verify if name servers are correctly configured or not. I possess no technical knowledge to change them myself. I would highly appreciate if your staff could help me in getting them configured correctly. I am ready to bear any charges for your time and service if needed. Thank you so much for your time and consideration. I look forward to hear back from you soon. [Account details or web address]. Uncontrollable amount of natural web traffic trying to access the site within the same time. Distributed Denial of Service(DDoS) attacks on the server where you website is hosted. Uncontrollable amount of unusual or bot traffic sent to your website. Affected web browsers and computers due to viruses and worms. Because you have hosted your website on a limited capability host and you get excess number of client requests to access that page that your server cannot handle. Low speed internet connections finding it difficult sending request to servers and receive the response. The possible solution to this problem is upgrading the resources to your server and improving the configuration that can handle ample of client requests at once. Also, consider security features in order to avoid hacker attacks on your website. Fixing DNS problems on your own computer – Sometimes, the DNS configuration on your own computer might get disturbed due to the recent changes you have made to your network or the changes made by your ISP. To detect if the error is with your computer, ask your friends to check if they could open your website without any glitches on their side. If they could open your site normally from their side, it would definitely your computer configuration problem. I have faced this situation in the past once and worried why my website alone is not working on my side. Later, with the help of my online friends, I could figure out the real problem is and changed and back the DNS configuration from Google to default. Fetch as Google – This is the simplest solution ever for this problem. Use ‘Fetch as Google’ option in Google Webmaster Tools to tell Google bot to re-crawl your website once. It will Google to update the status of your website. Perform this step even after solving the problem once. It will be helpful in reducing the ‘URL not found’ errors due to this DNS blackout. Hope these solutions would help you get your problem solved. Please share if you have any other or better solutions than specified ones. We’ll update them in the article with an attribution of your name. What To Do When You Cannot Play Any Game On Facebook? Gaming on facebook has ever been fun. The best part of it is that you don’t need to install any game on your computer or smart phone to play them. After all, you may need some basic tools like web browser and internet connection to play them. However, even having the required tools, you may not able to play any games of facebook suddenly since last log in. There are many reasons for it and you can’t just suspect a single one. Before going to troubleshoot the problem, answer my following questions at first and proceed with the troubleshooting process. Have you installed any software program last time? Have you just ignored any warning it showed last time? Are you sure your computer is running good in the last few log ins? Have you installed any updates on your computer? Is your internet connection speed good? Did you check it on other browsers too? Have you played any new games on facebook last time? Do you find any suspicious warnings, unauthorized access notifications on your facebook in the past? Any newly installed software might be conflicting with the plugins that are running on your browser. Check your software against vulnerability using your antivirus. Sometimes installed programs disable the necessary browser plugins on the computer and installs the unnecessary ones. Re-enabling the necessary and disabling the unnecessary can solve your problem easily. To re-enable/disable the plugins on Google Chrome, copy and paste the following path in your address bar and hit enter. Tick or untick the plugins to enable or disable them. Make sure you have enabled the ‘Adobe Flash Player plugin’ first of all. To re-enable/disable the plugins on Mozilla Firefox, copy and paste the following path in your address bar and hit enter. Navigate to ‘plugins’ and and make sure you have enabled the ‘flash’ plugin fist of all and disable the unnecessary ones. It is better to remove the programs that are conflicting with the browser plugins unless they are truly useful. I mean adware type of crapware specifically. The reason why most people fail to troubleshoot their computers is nothing but ignoring the warnings and notifications the operating system show. Every warning has its meaning and you just ignored the to understand. Tune your computer by running the maintenance wizard on it or using a third party software. Download and install recommended updates on your computer after maintenance was done. Never ignore any future warnings as they help you solve the problem in short time and in an easy way. You faced a problem with it today doesn’t mean that it is originated now. It might be because of the past problems you have been facing with your computer that are ignored. Optimizing the computer, scanning for vulnerabilities and installing updates can help in most possible cases. If it doesn’t solve your problem, go for the operating system repair or reset your computer in case you are using Windows 8. Installing updates would update your software on your computer. Updating software is not same as troubleshooting. The reason why I suggested you to go installation of software updates is to eliminate the possibilities of rising incompatibilities of latest technologies on your web browser and operating system. Re-check the installed updates and explore if any conflicts were found among two or more programs. For example, some third party antivirus programs check for incompatible software on the computer before they start the installation wizard. There is no point of checking all the above solutions before checking the internet connection as we are troubleshooting a gameplay online here. Check if your modem is working good. Check the speed of your internet connection and see if is quite enough to stream games online. You cannot play games on Facebook doesn’t mean that you cannot play it on other browsers too. Check if the game can be played on other browsers also or not. If you can play it on other browsers, simply update the faulty browser or reinstall it. If you cannot play it on other browsers too, go with the other solutions. Solution 7: Played any new games on facebook? An online gamer would ever be on hungry for new games. I know you are too. Do you know that the most facebook hacks are happening are because of the games you play online? There is a technique called tab nabbing technique through which a hacker can trick you to get your login credentials and can access your facebook without your consent. The hacker might have blocked the most lovable game of yours in your facebook apps list. Login to your account firstly and change your password. This time choose a strong password that is hard to understand and crack. Then unblock the app from your blocked app list. Solution 8: Any suspicious activity on your facebook? Every suspicious activity is not only because of some living hacker but also some potentially harmful code. Posts like Malaysian airlines flight found, John Cena died in the ring comes under those categories. Facebook spam links look seductive and all it wanted is a click on it. Once clicked they will spread to your friends lists and their timelines and inboxes so viciously. Use a good antivirus+internet security program and keep it updated from time to time. It can at least warn you not to proceed with the link you have clicked there by stopping the activity of the code before it shows an effect on your profile. Hope I covered the most possible cases and solutions. Though, there might be some other reasons also for not allowing you to play games on facebook. Have you ever faced any problems while playing games on facebook? Share your experiences with us in comments below. We often come about some issues regarding the video calling on facebook. Here is the troubleshooting guide for video calling on facebook with solutions for mostly raised issues. Case #1: Call disconnects upon connecting – Facebook video call runs with the help of Skype plugin. Skype have difficulties running on low speed bandwidth connections. If you are a regular Skype user, you would have noticed this issue earlier. But Facebook can even run on low speed bandwidth connections. Bandwidth may not be the only cause for quick disconnections. If you are sure about your internet speed and think it is because of another unknown reason, report the issue to facebook. Case #2: Showing “Software is temporarily unavailable” – This error might be because of Skype plugin again. Try restarting the tab or web browser, if it doesn’t work, try it on another browser. If nothing works, try to reinstall the video calling plugin for the browser. You can also remove the old plugin from programs >uninstall a program option in control panel in Windows. To remove the plugin in Mac OS X, search for FacebookVideoCalling file and delete it. Case#3: Error while installing video calling software – Check if there are any blocking rules applied to your username on your computer. If you are the only one using computer with administrator privileges and sure about software installing authorization on your computer, it might be a bug on facebook. Report the bug to facebook or wait till is fixed by themselves. Case #4: Video call quality is too low – The quality of the video call may not always depend upon the speed of the internet connection. It might be because of the outdated web browser you are using. Update your web browser in this case. The quality of the webcam should also be considered here. You could never make a quality video call unless you have a high quality web camera. Upgrading your web cam to high quality one can make the difference. Pause all the downloads and close all unused applications to improve the performance of the video call. If you are trying to make the video call from your laptop, make sure it is not running out of battery or in power saving mode. Case #5: Other person can’t see you or vice versa – This happens when there is problem with your webcam. Go to control panel and configure the default webcam device. Case #6: Headset/Microphone isn’t working – Check if your headset pins are correctly plugged in. If correctly plugged in, check if your headset is set as the default device or not. Also check your microphone/headset’s mute button. Some headsets are muted by default when they are plugged out, we need to turn them back to unmute state. Did you ever face any problem with facebook video calling? How did you come over the issue at last? Share your bad video calling experience in comments. Since Microsoft has ended support for Windows XP, users who didn’t want to upgrade their PC’s for some reasons were started to struggle in the misery. Though there is a need to upgrade, people don’t wanted to take any kind of risks regarding the productivity. It is obviously true by the fact that the 95% of the computers in the world are using Windows XP. Taking from home to office desks, the upgradation would benefit Microsoft a lot of bucks. Small companies even don’t wanted to take any financial risks regarding the upgrade. The concern about security of many of the small scale organizations and home users have risen to peaks and it motivated hackers to focus more on the Windows XP users as much as they can before they get it upgraded. Microsoft provides some security advices to its users regarding the ending of support to XP in which they try to convince and compel them to use Windows 8.1. Microsoft also lists out some error codes and quick fixes for them in a table. You may not find information about every error code in it. This device is not configured correctly. Code 3 The driver for this device might be corrupted, or your system may be running low on memory or other resources. Code 10 This device cannot start. Code 12 This device cannot find enough free resources that it can use. If you want to use this device, you will need to disable one of the other devices on this system. Code 16 Windows cannot identify all the resources this device uses. Code 18 Reinstall the drivers for this device. Code 19 Windows cannot start this hardware device because its configuration information (in the registry) is incomplete or damaged. Code 21 Windows is removing this device. Code 22 This device is disabled. Code 24 This device is not present, is not working properly, or does not have all its drivers installed. Code 28 The drivers for this device are not installed. Code 29 This device is disabled because the firmware of the device did not give it the required resources. Code 31 This device is not working properly because Windows cannot load the drivers required for this device. Code 32 A driver (service) for this device has been disabled. An alternate driver may be providing this functionality. Code 33 Windows cannot determine which resources are required for this device. Code 34 Windows cannot determine the settings for this device. Code 35 Your computer's system firmware does not include enough information to properly configure and use this device. To use this device, contact your computer manufacturer to obtain a firmware or BIOS update. Code 36 This device is requesting a PCI interrupt but is configured for an ISA interrupt (or vice versa). Please use the computer's system setup program to reconfigure the interrupt for this device. Code 37 Windows cannot initialize the device driver for this hardware. Code 38 Windows cannot load the device driver for this hardware because a previous instance of the device driver is still in memory. Code 39 Windows cannot load the device driver for this hardware. The driver may be corrupted or missing. Code 40 Windows cannot access this hardware because its service key information in the registry is missing or recorded incorrectly. Code 41 Windows successfully loaded the device driver for this hardware but cannot find the hardware device. Code 42 Windows cannot load the device driver for this hardware because there is a duplicate device already running in the system. Code 43 Windows has stopped this device because it has reported problems. Code 44 An application or service has shut down this hardware device. Code 45 Currently, this hardware device is not connected to the computer. Code 46 Windows cannot gain access to this hardware device because the operating system is in the process of shutting down. Code 47 Windows cannot use this hardware device because it has been prepared for safe removal, but it has not been removed from the computer. Code 48 The software for this device has been blocked from starting because it is known to have problems with Windows. Contact the hardware vendor for a new driver. Code 49 Windows cannot start new hardware devices because the system hive is too large (exceeds the Registry Size Limit). Code 52 Windows cannot verify the digital signature for the drivers required for this device. If you are finding errors even after troubleshoot, it is better to reinstall the operating system.